Helps improve tone and texture. Protects against environmental damage. 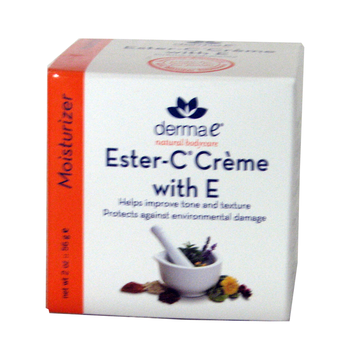 Bio-available Ester-C protects skin from free-radical damage and helps support collagen and elastin health. E Complex ingredients including vitamin E, Borage Oil and Green Tea Extract provide antioxidant properties to help protect skin from environmental damage. 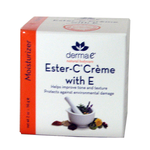 Use moisturing Ester-C Creme for dry to normal skin, or Ester-C Serum for normal to oily skin. Water Aqua, glycerin, carthamus tinctorius safflower seed ooil, stearic acid, calcium ascorbate ester-c, borago officinalis borage seed oil, tocopheryl acetate vitamin E, organic carmellia sinensis green tea leaf extract hellanthus annuus sunflower seed oil, organic chamomilla recutita matricaria flower extract, cucumis sativus cucumber fruit extract, organic aloe barbadensis leaf extract, sesamum indicum sesame seed oil, polysorbate 60, panthenol, allantoin, retinyl pamitate vitamin A, glyceryl stearate, cetyl alcohol, xanthan gum, glyceryl stearate se, glyceryl stearate citrate, cetearyl glucoside, gluconolactone, sodium benzoate, natural and fragrant oils.